-including work for Tornado, but not for Action. Even the safest artists can deliver the 2000AD goods! No-frills, no-nonsense, super clear and easy-to-read storytelling. There’s also something about White’s style that, to me, is incredibly British. Perhaps even more specifically than that, 1960s-1980s British. The clothes people wear, the suburban setting, the general atmosphere of a country that is starting to pull itself out of wartime austerity and into affluence, with a renewed sense of class division. The fashions of the far future never felt so from the past. Not to mention the attitudes... or are they??? (Or maybe that’s a reflection of scripts from Alan Moore, who had some opinions on this sort of thing). This whole sequence may be simple, but deeply effective both at communicating character and story. Top marks! Let’s be honest here, Mike White was never 2000AD’s flashiest artist, and his style is so specifically old-fashioned that he was commissioned to draw a couple of mid-1990s episodes of Armoured Gideon in which the action pointedly shifts back to the early 1970s days of 2000AD / IPC comics. But you know what? That doesn’t mean he’s no good! On the contrary, Mike White fulfilled a very important role – being accessible and reliable. 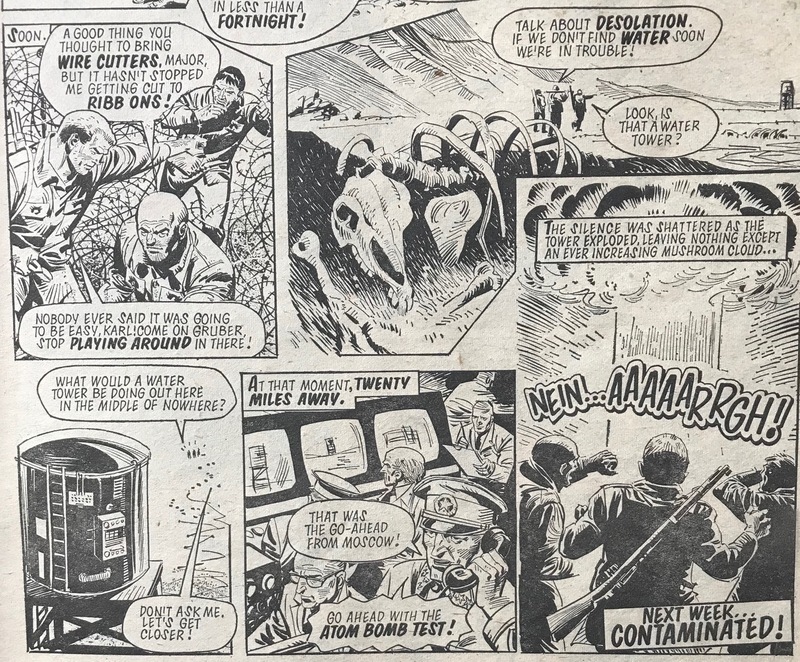 If you’re reading this blog, chances are you’re a long-term comics reader. But you’ve probably had experiences of trying to get people to read comics and discovering that they simply don’t know how. It is a skill, similar to but not exactly the same as reading prose. Why not give them a Mike White comic to read? 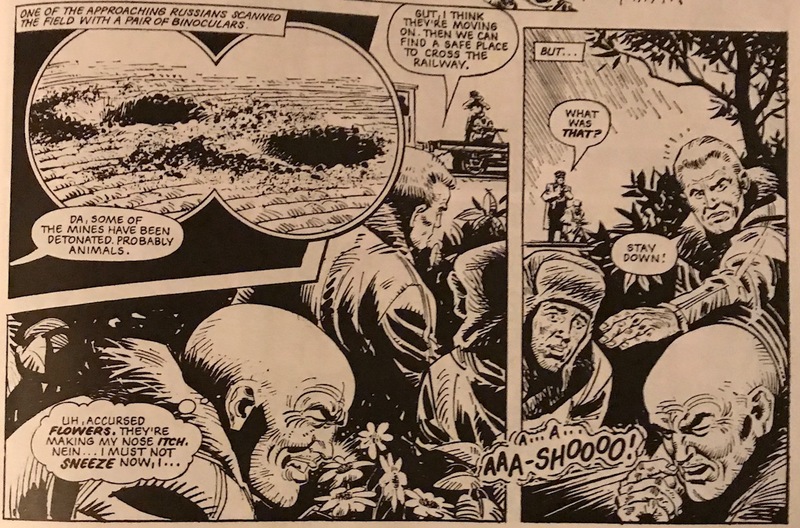 If it’s a grown-up, I recommend his Future Shocks and Time Twisters, being as they have some sophisticated writing (looking at you, Steve and Alan Moore). You've got all the fun of circular and trapezoid panels, but no confusion about what's going on. If it’s a child, you could do worse than a hit of late-period Mean Arena. Sure, the overall story will make no sense, but the panel-to-panel action storytelling is clear, simple and approachable. They might even be fooled into thinking that Mean Arena is story worth tracking down in its entirety. Simple, clear choreography, with a running undercurrent of violence that is actually far nastier than this art implies. I mean, imagine the same sequence illustrated by Chris Weston, it'd be obscene! 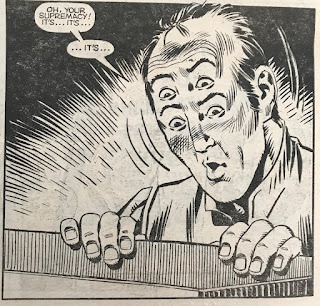 And that’s the key to teaching anyone, young or old, how to read comics – showing them something that’s just plain simple sequentials. With Mike White, it’s never unclear who the story is about, where the action is happening and above all, what each character is doing and thinking. Super basic stuff that you can never take for granted, and the mark of a good comics artist if they get this stuff right. Sure, it’s not often flashy or splashy, but boy does Mike White nail the fundamentals. If there’s one quirk he displays that doesn’t always come off, it’s his desire to break out of the grid structure. Look at a Tintin or Asterix book and nearly every page has a very rigid 9 by 9 square panel layout, with the immediate advantage that you can’t possibly read the panels in the wrong sequence. White, on the other hand, clearly found this too boring so he often arranged his pages with panels that push out of the grid, or fit around circles, trapeziums and other shapes. It can help bring a whole page of art to life, give it some dynamism – but occasionally it creates sequence confusion. Adding in curved borders for extra dynamism. Let’s look at the stories themselves. 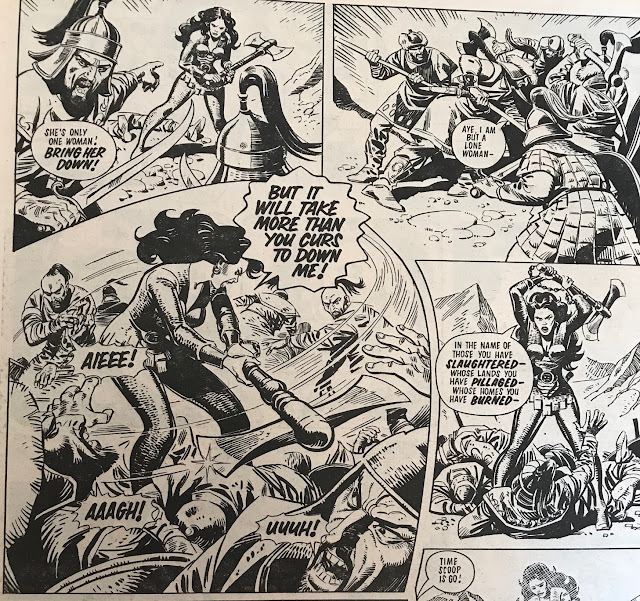 Before 2000AD started, Mike White was already go-to artist for IPC in the 70s, and worked on the full range of action, adventure, sports and girls’ comics (as near as I can tell, anyway). 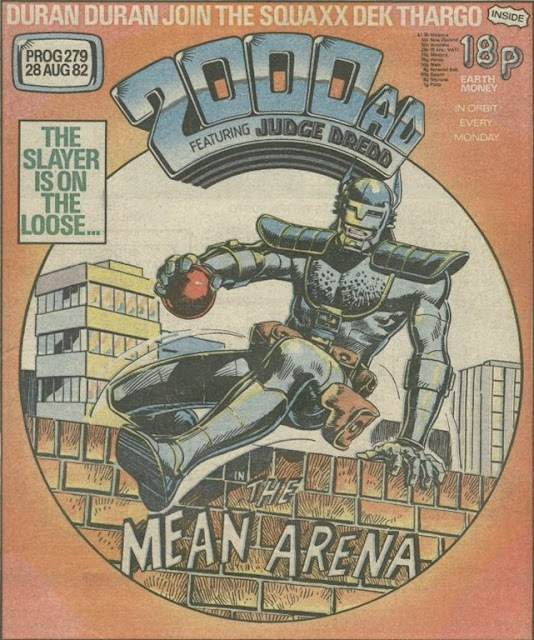 He made his way onto 2000AD somewhat sideways, after producing strips for Action*, before pitching in to help other artists out on Tornado, and then getting the odd bit of work on Future Shocks. Never sneeze in a minefield. Wagner & Co encounter one of those 'not really fatal' nuclear explosions so popular in 1970s dramas. True, he didn’t get to create any of the characters from the early days, but he did pitch in, presumably helping out artists who needed some breathing room to hit their deadlines. White pulls off an impressive Vanyo pastiche - it's the extra ink that does it. 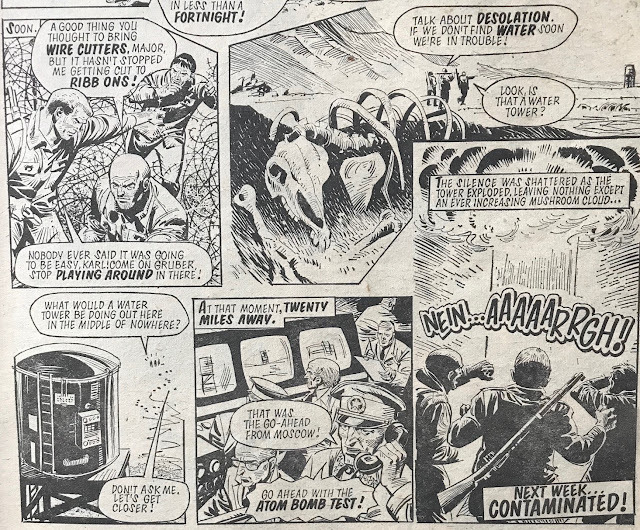 If there’s a niche White was put into, it’s a mix of action stories with contemporary settings coupled with ultra far-future stories that are, on the whole, making some pointed comment about the contemporary world. 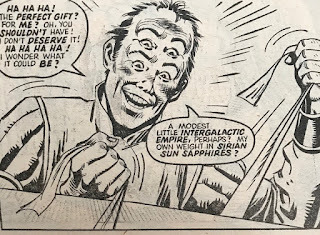 Yes, I know that’s kind of the deal with Science Fiction, but there’s something about the way White’s stories work that led him to make even the 32nd century feel specifically like 1970s Britain - but with shinier clothes. Now that's what I call an establishing set of panels to introduce setting and characters! Masterful. But also retro-future to the max. 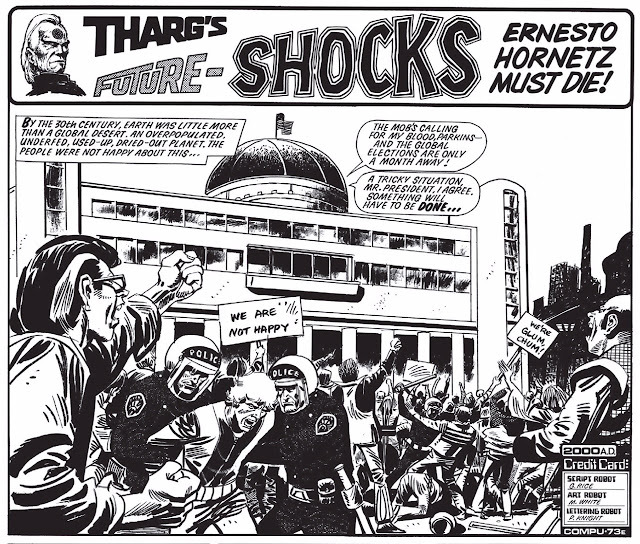 More angry mobs from the 30th Century, 20th century style. 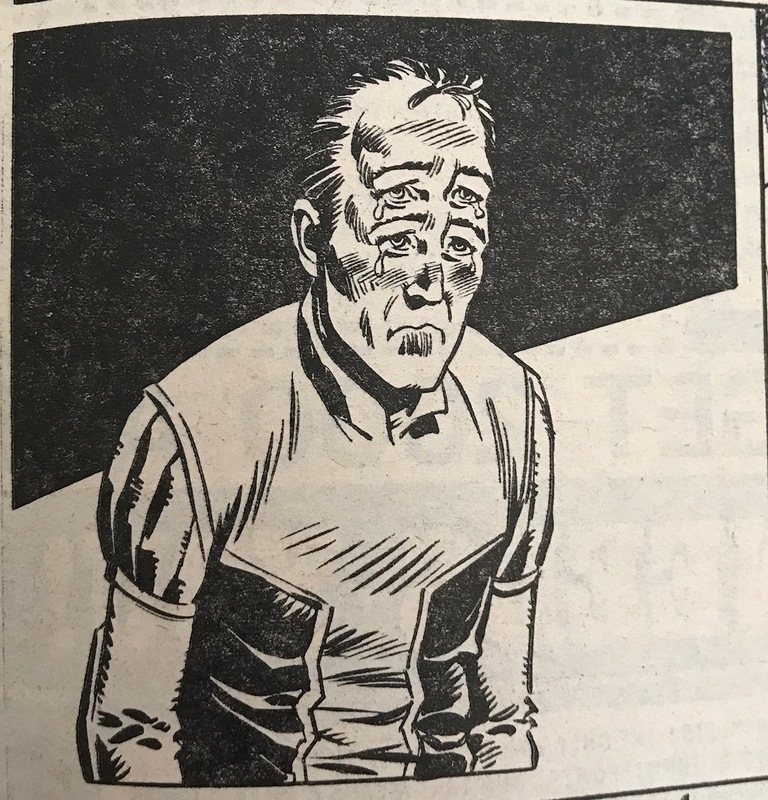 Not least Abelaard Snazz, a far future 1970s character if ever there was one, and, I suspect, the strip most readers of this blog will think of when they hear the name ‘Mike White’. 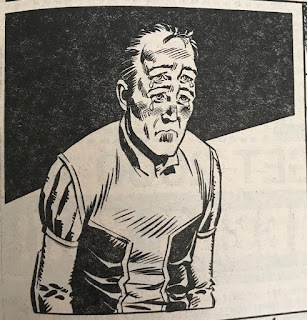 He didn’t create the character (that was a young Steve Dillon), but he did draw the bulk of the man’s misadventures, and absolutely nailed the ‘failed game show host’ aesthetic that Snazz embodies. I mean, he never was a game show host, but you gotta admit there’s something of the Michael Barrymore, Noel Edmonds and above all, Alan Partridge about him. There's simply no way to misread the set-up here of obnoxious buffoon, simpering Droid and irate gangster. Well, what do YOU think a Neuron whisk would look like? 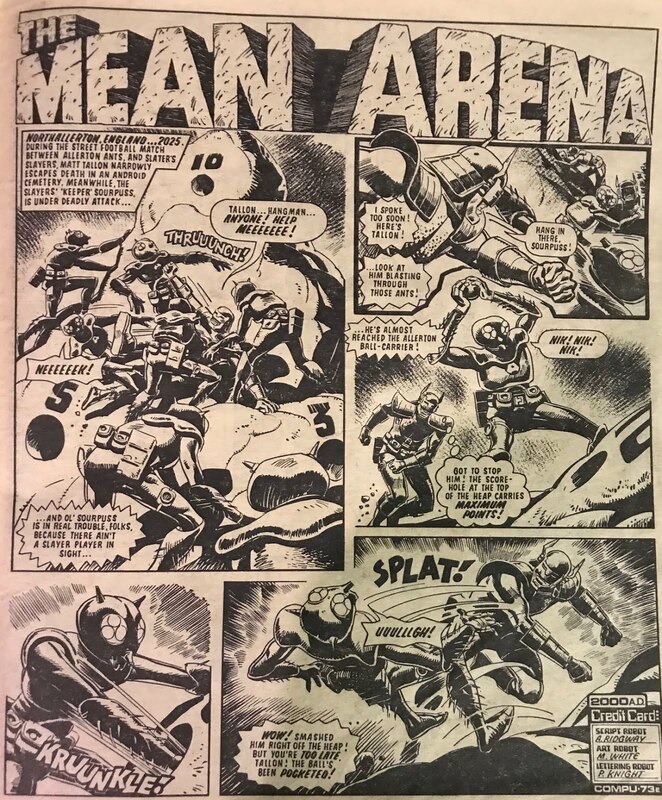 White’s single biggest stint as a regular artist in the pages of 2000AD was on the back half of Mean Arena. 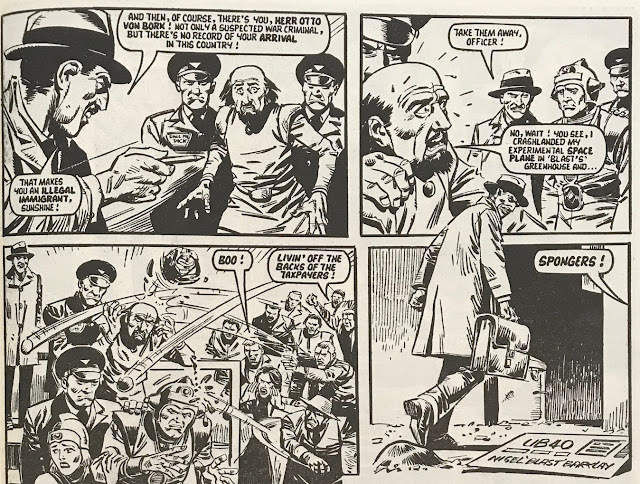 A story that was part sports comic, in which ‘our team’ of Slater’s Slayers took on a string of opponents dressed in themed costumes, playing the ultra-violent game of street football. White gives us the goals and the glory. Yes, to some extent this arts lacks lustre, but it's at least clear. This, on the other hand, has it all going on! Awesome ant-based costume design, clear location, and intense action. …and part murder revenge evil conspiracy comic. This side of Mean Arena, with its robot sidekicks and grisly deaths was occasionally compelling, often weird, and to be honest not the best fit for White. but what's the tone of this thing? Serious? Grisly? Silly?? This kind of macabre antihero storytelling needs either a murkier artist (as we got occasionally with Eric Bradbury), or an out-and-out gnarly action artist (as we got occasionally with Steve Dillon). And after all the murder and mayhem, this is the big send-off? 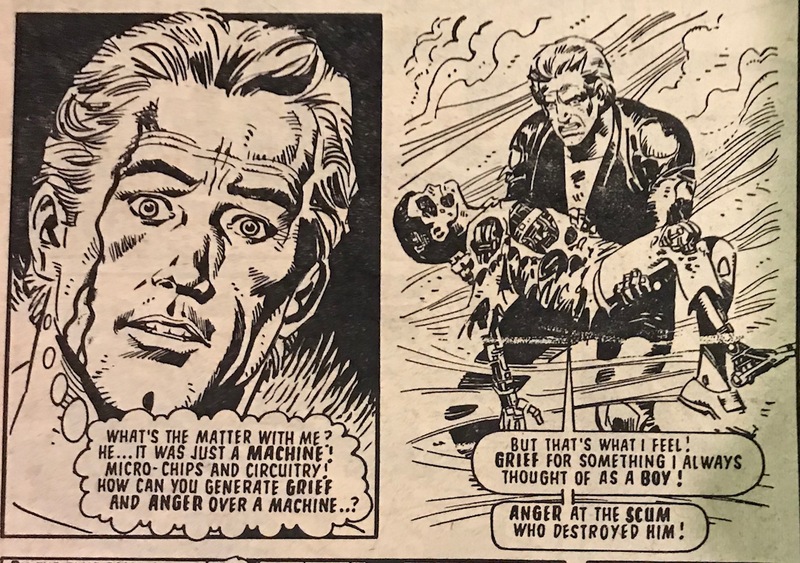 With Mean Arena sent off to the Thrill Palace in the sky, White’s slate was clear to get back to delivering Future Shocks and Time Twisters, which suited his skills perfectly. 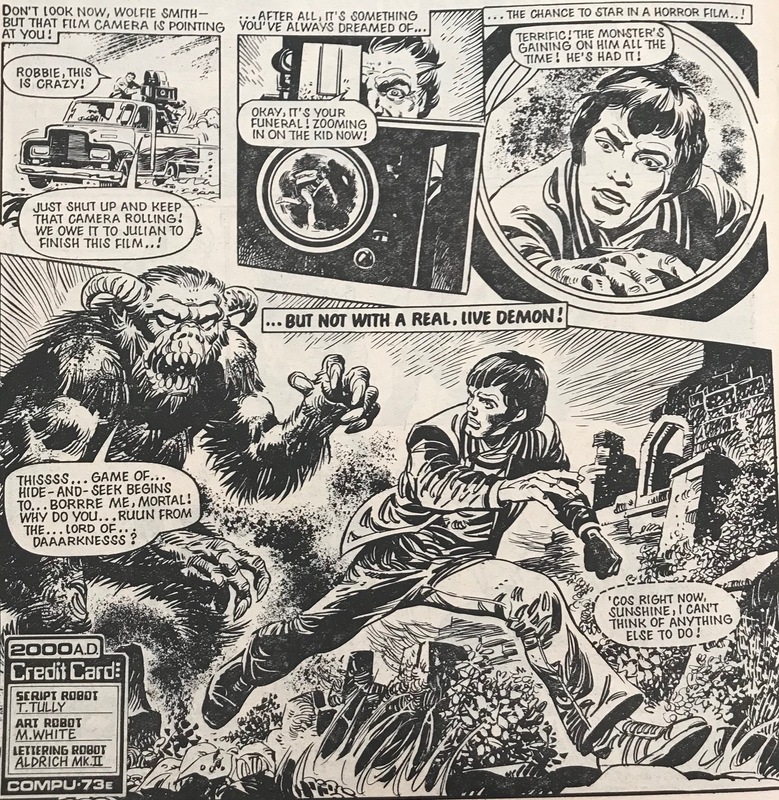 Oh, and the odd Tharg story, which frankly suit no one’s skills. 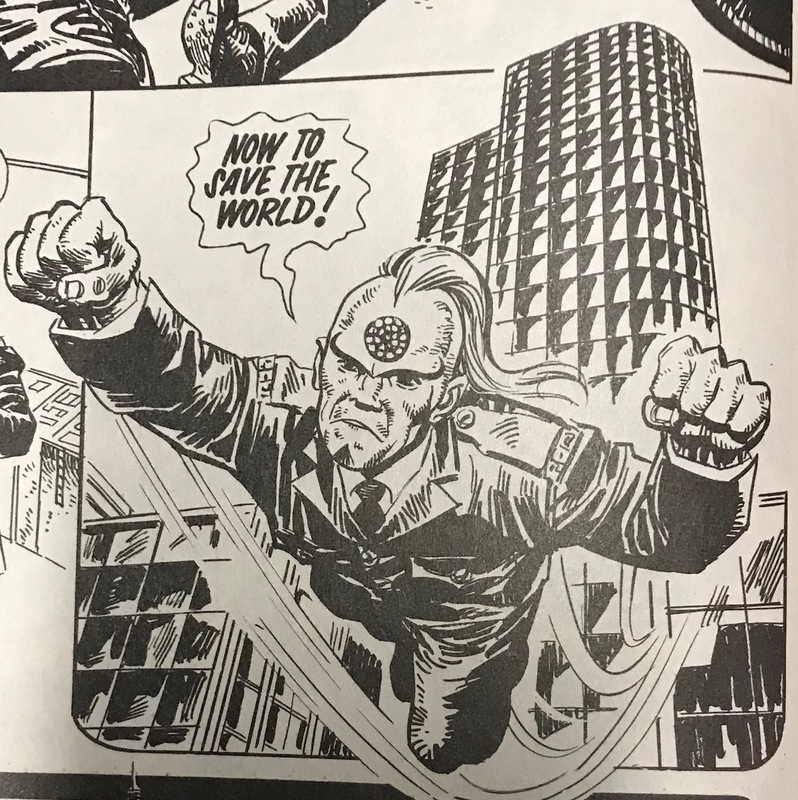 There is generally some fun to be had seeing Tharg interacting with the real world; certainly the episodes based around the Nerve Centre tend to be the better ones. The ones where he’s fighting his own alien foes (or naughty nephews), not so much. 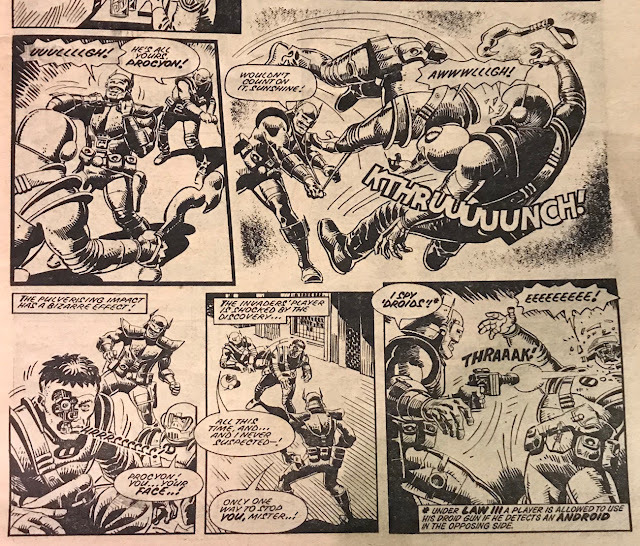 By story's end, it's no longer a superhero comic, more of a British humour tale complete with a young menace getting a spanking. Back to the Future Shocks! From an artist point of view, what you want is to create clearly defined characters, a setting you can get your head around, and some facial expressions ranging generally from smugness at the start to horrific realisation by the end. In other word’s Mike White’s personal toolkit. The archetypal Future Shock protagonist - a nobody with a sneaky idea, on his way to becoming a somebody. More expert superhero comic stylings. Could it be that Mike White deserved to join Dave Gibbons et al in the great DC stealing of British artists? 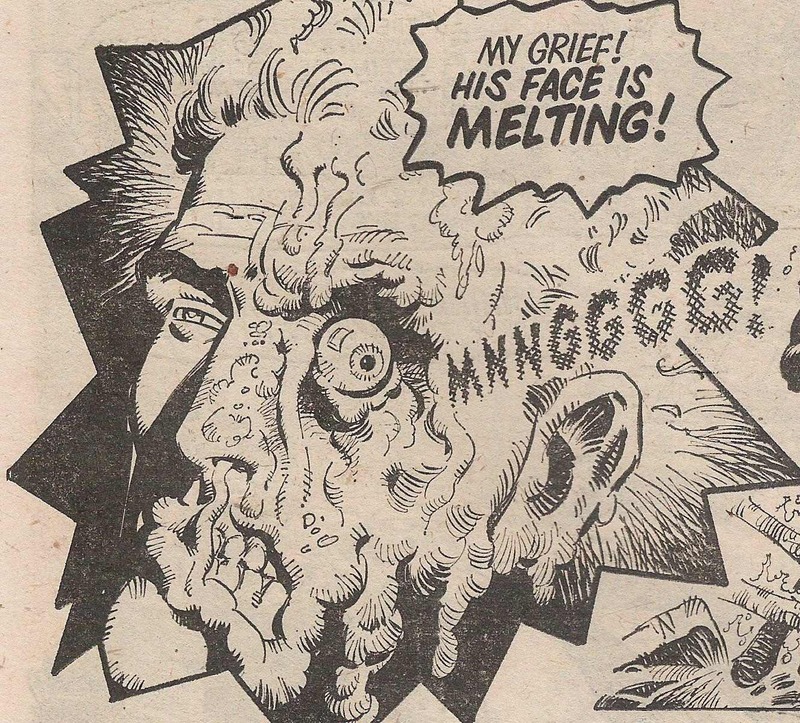 This might be my single favourite Mike White panel. I'm a sucker for detail, and those ragged clothes turning to dust are stunning. 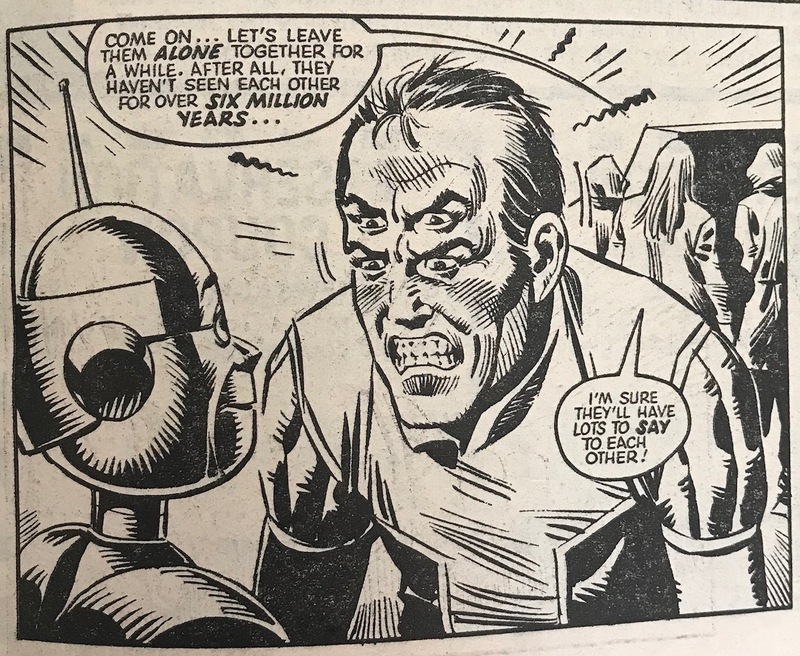 Ironically enough, White’s most famous effort (and perhaps many people’s favourite ever 2000AD one-off story) involves neither smugness nor horror, but a simple life of happiness, sadness and occasional boredom, with a killer punchline of an ending that works precisely because it’s rooted in the mundane. It’s the Reversible Man, and if you haven’t read it yet, you should! 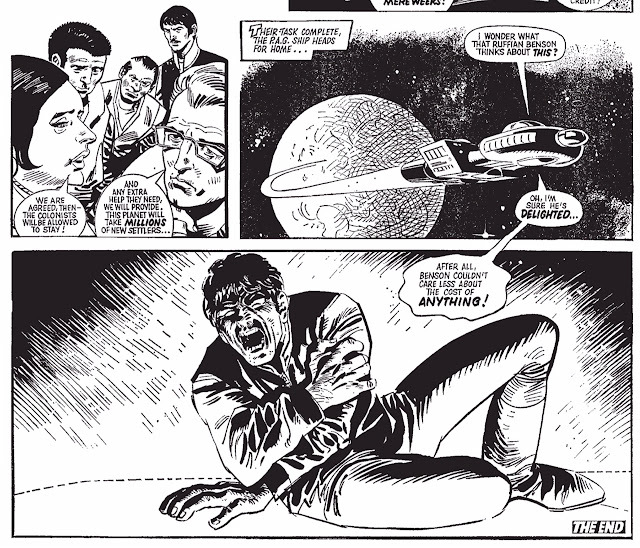 The detail is dialled way, way back to let the story and simple, real world emotions take centre stage. Hard to imagine any other artist providing a more effective rendering of this classic tale. 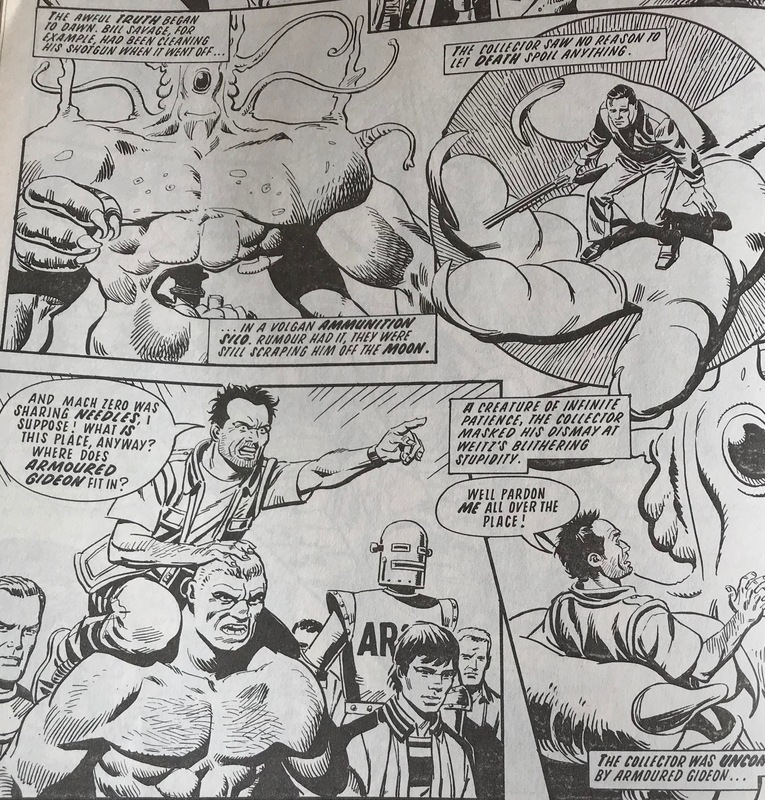 In amongst all that, he found time to do that one episode (plus a couple of panels) on Armoured Gideon. You can see that his style has moved on a fair bit from the early 80s stuff, but it’s very deliberately using his beloved panel layouts, and is very much in on the joke of reviving long-forgotten 2000AD action heroes, and a long-forgotten aesthetic to match. 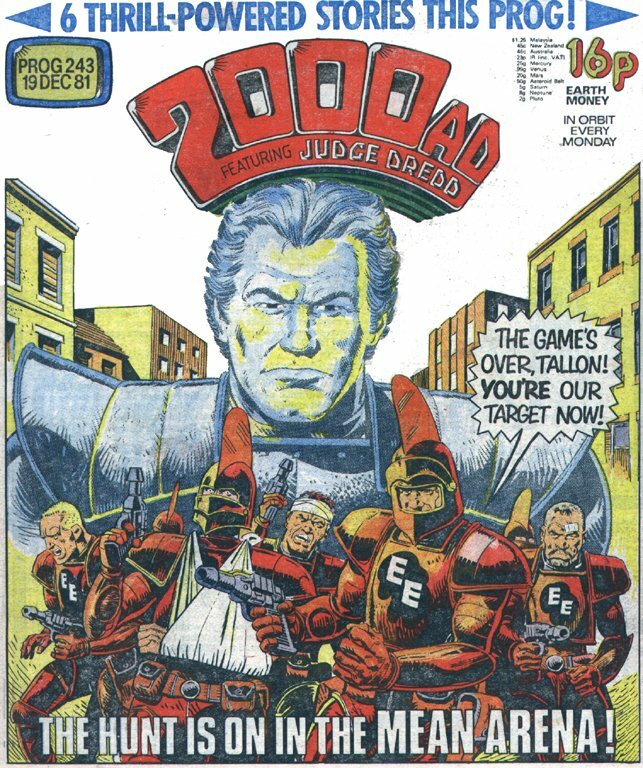 White didn't draw the old 2000AD runs of Dan Dare, MACH O, Wolfie Smith and Bill Savage, but you'd believe it if he did. A long career behind him, Mike White passed away in 2012. Agent Rat is the business. 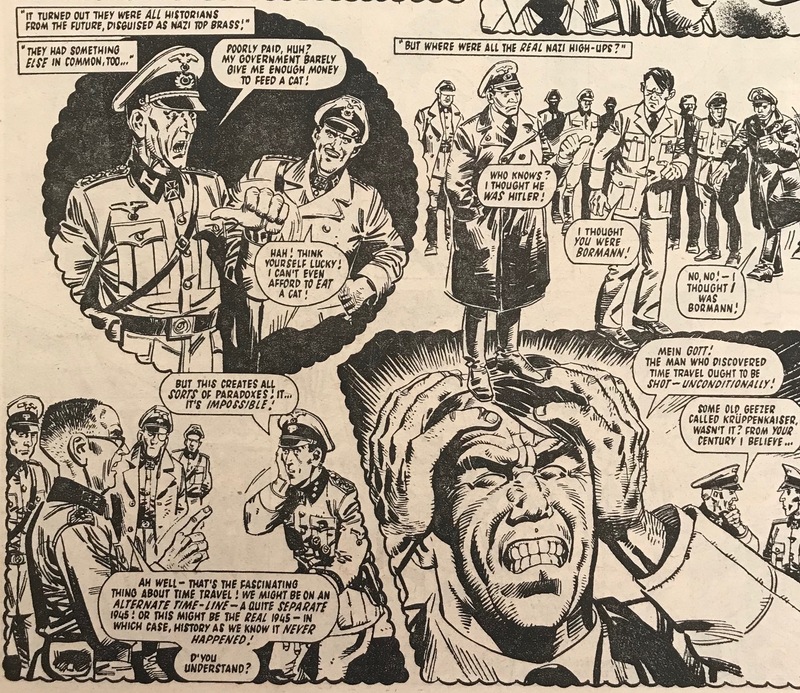 *He was the initial artist on Hell’s Highway, and later took over the art on Kids Rule OK (aka the strip that got Action banned, and then watered down). **Wagner's Walk is almost entirely credited to 'R.E. 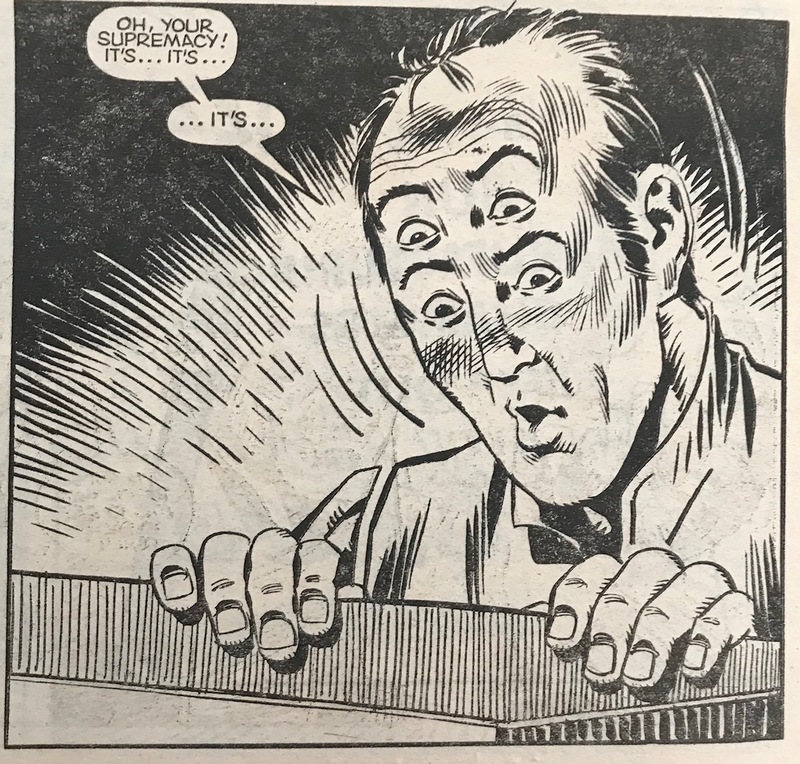 Wright', which I believe was a generic pseudonym used by IPC authors who felt their strip had been 're-written' too much to count as their own work. 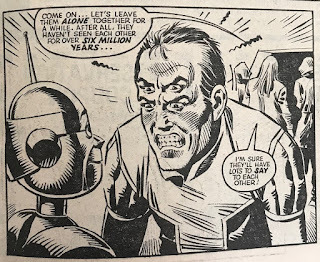 2000AD fans will be SHOCKED to learn that Pat Mills was known to use this particular pseudonym, but it's not clear to me that Wagner's Walk was one of those examples, although Barney says it is Mills's work. I can see the premise as being a Mills joint, possibly one created for Battle that an editor re-purposed for Tornado and handed over to another writer. Apparently, no one who might know cares enough to remember! ***This comic was edited by long-term Tharg sidekick Richard ‘err, um’ Burton, so it’s no surprise there’s an overlap of talent, really.